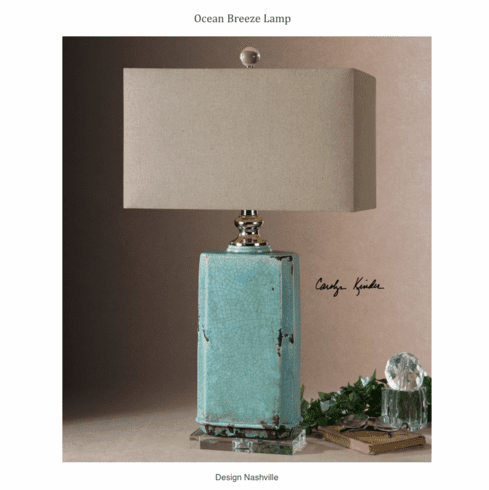 The Ocean Breeze lamp is sophisticated with rustic details. Shaping is transitional featuring a beautiful crackled aqua finish on the lamp column, nickel plated accents and crystal finial. The shade is rectangular hardback in rust bronze linen fabric with natural slubbing. Because of the nature of fired ceramic glazes, finishes will vary within the lamp and from lamp to lamp. Save 12% when you order a pair! Use code "SCORE2" at checkout.